Why me, Saint Lidwina? : What does Stitch Think? It's hard for me to comment back on the posts, but thanks for all the encouragement. Last night we hit Public Ice on Thursday for the first time in ages, and I actually made a concerted effort at practicing. I did crossovers until my legs were sore, stroking with my free leg back and not to the side, and backwards half pumps. Towards the end of the session, I got really brave and tried backwards stroking and T-stops. (Holding the wall... does that count?) I want to go back tonight. Stitch enjoys just playing around, and he was all over the place. He made snow with his friends, ate ice cream, and harassed Rink Pal. On the way home, I felt pretty good about what I'd done. "What do you think?" I asked him. "Think I could do this?" "Doesn't seem too hard. Just a lot of practice. Maybe I could be doing back crossovers by the end of summer. Maybe I could compete someday." "Sure. Why not? Other adults do it." "Uuuh, okay..." He really didn't know about this idea. "Think I could look good in a skating dress?" I polished off that thought with *after you drop about thirty pounds* in my head. "Please don't do that," I could hear his dread. "Because that would be embarassing." On this point, I have to agree with him. I'll need to come up with something reasonable to skate in. 30lbs? Sweetie, if you drop 30lbs there won't be anything left! Glad you're having fun, even if Stitch doesn't quite know what to make of the situation. But he's not exactly a normal kid...so why should he expect to have normal parents? YAY! 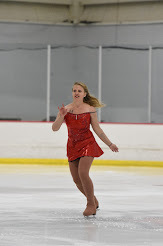 Another adult skater for me to commiserate with! I've been skating off and on for about two years now. If I skate three times a week, I progress. Two times a week and I maintain skills pretty well. I'm nowhere near testing, but I think I'd like to work toward the Adult Pre-Bronze moves. I just wear stretch pants right now. Not sure about competing, but I have no idea what my kids would give me the okay to wear, lol. YAY again! And ignore my Facebook thing. That was completely freakish, you know? I do wear wrist guards to practice now and for doing more backward stuff I'm going to get one of those Ice Halo things. Also, maybe, a tailbone pad. I'm so excited to hear you are going to learn to skate! The good news about the skating dress: you don't have to wear one. A floaty skirt over leggings will work just fine, and with your skills, you can probably make something fabulous. The kids at our rink LOVE to cheer for the "skating grandma" of the group. She told them they have to cheer for us all, so we get a synchro-style "shake it" cheer, before we all skate! Too fun!